A recently deceased monkey being laid to rest in a child’s coffin as an aging, silent-film star shakes with sobs of grief. A creepy butler watching it all. The ominous sense that there is no escape. It is clear from the beginning that nothing good is going to come from Joe Gillis (Jordan B. Stockdale) finding himself in the living room of Norma Desmond. The good thing that does come from it is the Way Off Broadway’s production of Sunset Blvd., which culminates in a few outstanding moments in the second act as the tragic tale rushes towards its conclusion. Bill Kiska and Jordan B. Stocksdale nicely create a simple set that provides the illusion of excess and opulence. There are nice details like the pictures on the wall that actually look like they could be a young Jeanine Collins. The stairs sometimes appeared to not be properly attached to the rest of the set, but it was an overall very nice effect. The scene changes were seamless for the most part, although there was one time when the movement of set pieces behind the curtains was distracting. The story begins with Joe Gillis, a struggling screen writer. Stocksdale takes a little time to settle into the role, but, by the opening of Act II and the number “Sunset Boulevard,” he truly finds his stride. His power note at the end of the song was striking. Similarly, Collins almost goes a little overboard in the first act, but she finds Norma’s heart beautifully in “As If We Never Said Goodbye” and exquisitely lays open her broken soul in her final monologue. The leads are evenly matched with the solid supporting performances from Zane L. Oberholzer, Jr. as Max Von Mayerling and Joey Banigan as Betty Schaefer. Oberholzer has a gorgeous voice and there are moments were you can see the intensity of emotion that he keeps restrained. Banigan was a charming ingénue, and she appears to have a lovely voice, although she seemed to be losing it some during this particular performances. You could hear the control that she used to sing through as best as possible. The only major tweak for this production would be the sound mix. At times, the music swelled over the voices, when the voices should have swelled over the music. Occasionally, the climax of a song was swallowed by the background tracks. The closer an actor was to the front of the stage, the better the mix that was achieved. 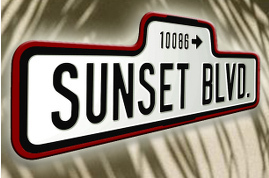 Overall, if you travel to Way Off Broadway to see Sunset Blvd, you will not be disappointed. It was an enjoyable evening, and it is especially a treat if you are unfamiliar with the show and get to experience the plot twists and turns for the first time. Max Von Mayerling: Zane L. Oberholzer, Jr.
Disclaimer: Way Off Broadway Dinner Theatre provided two complimentary media tickets to ShowBizRadio for this review. This article can be linked to as: http://showbizradio.com/go/9724.